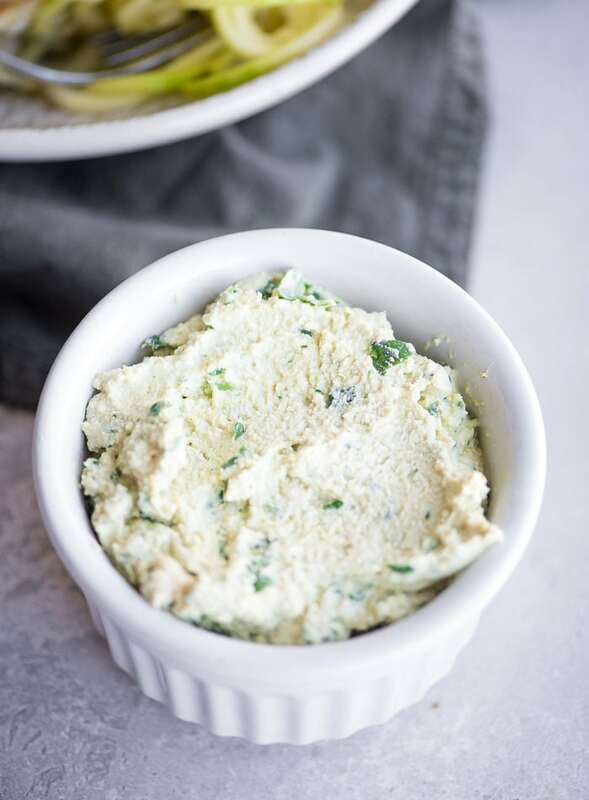 This vegan herbed tofu ricotta is a great staple to keep on hand to add flavour and protein to meals. 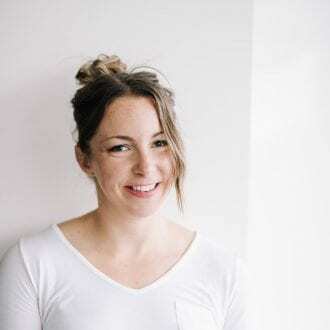 It can be used with zoodles, stuffed in shells, used for lasagana, spread in sandwiches and wraps or as a dip for raw veggies. 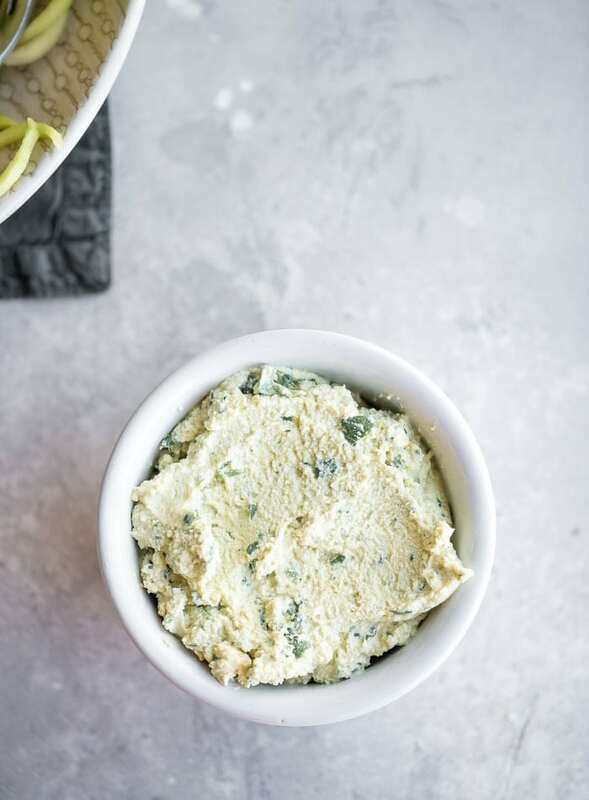 Tofu ricotta is a breeze to make and tastes amazing mixed into pasta dishes, spread on toast or as a dip for veggies. I’ll even mix it into things like tofu scramble or serve it on top of kale salad. It’s great with avocado toast too like on my spinach avocado toast or white bean avocado toast. To make it, just blend tofu, sea salt, garlic, nutritional yeast, lemon and apple cider vinegar and then pulse in some chopped fresh herbs. It can be served right away or stored in the fridge for up to 3 days in a sealed container. It actually tastes even better the next days so there’s nothing wrong with having leftovers! You can leave the fresh herbs out for plain ricotta but for a herbed tofu ricotta, I recommend adding a big handful of fresh basil. 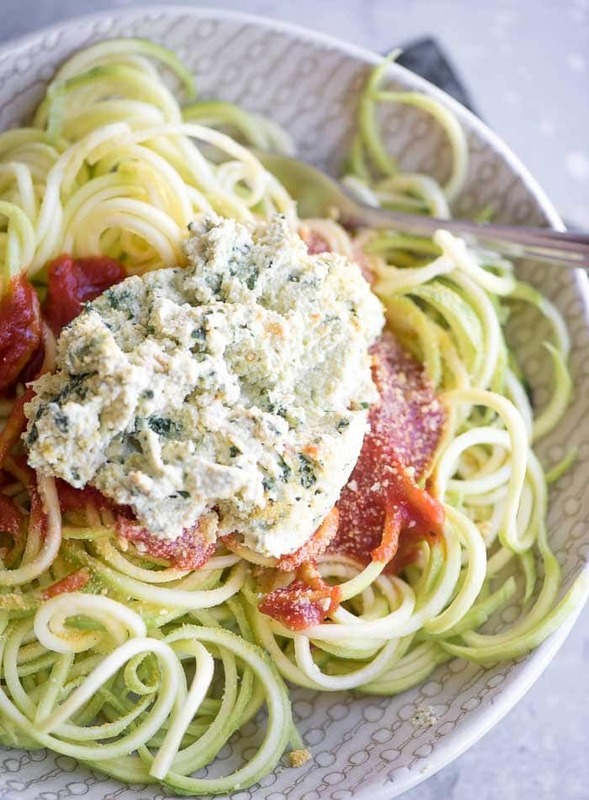 My favourite way to use tofu ricotta is with zoodles, tomato sauce and nutritional yeast or vegan parmesan. 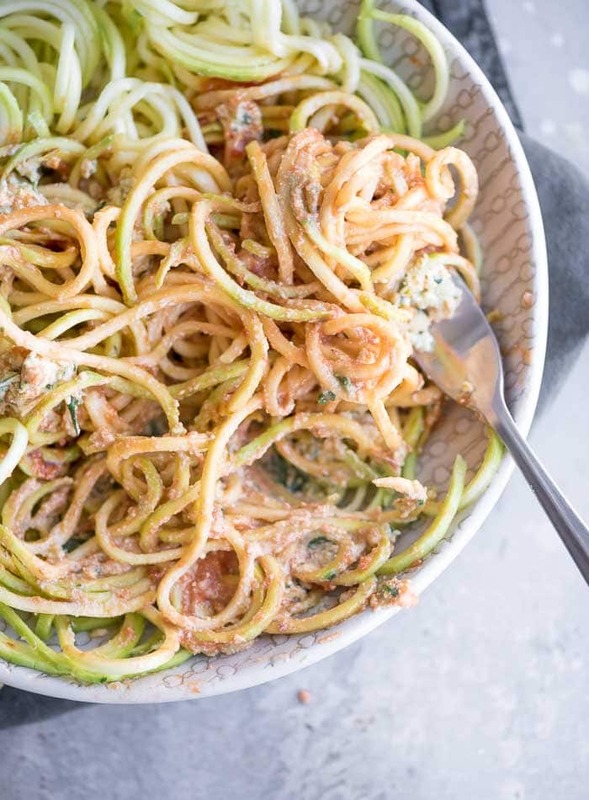 All you need to make this simple vegan pasta dish is zucchini, your favourite tomato sauce and the tofu ricotta ingredients. I would recommend an organic tomato-based sauce such as arrabiata, tomato basil, marinara or roasted red pepper. You can make the sauce a little more hearty by mixing in diced veggies such as onion, garlic, peppers or red lentils like I did in the recipe. Mushrooms, zucchini and spinach is also yummy. What makes it so good though is the creamy tofu ricotta. As it melts into the sauce and the nutritional yeast topping, it’s just so creamy and delicious! 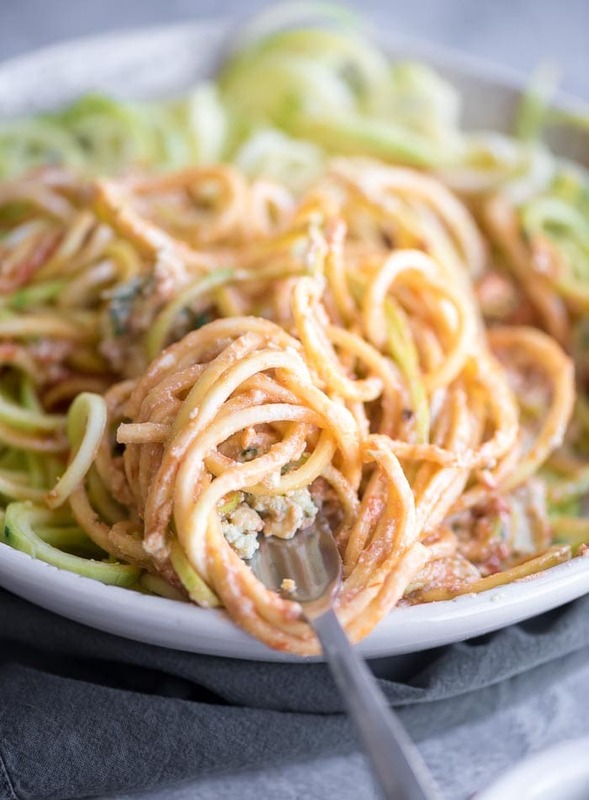 For more pasta sauces ideas, you could also add tofu ricotta to my red lentil tomato sauce, Roasted Red Pepper Pesto, Vegan Spinach Pesto or Roasted Garlic and Red Pepper Zoodles. 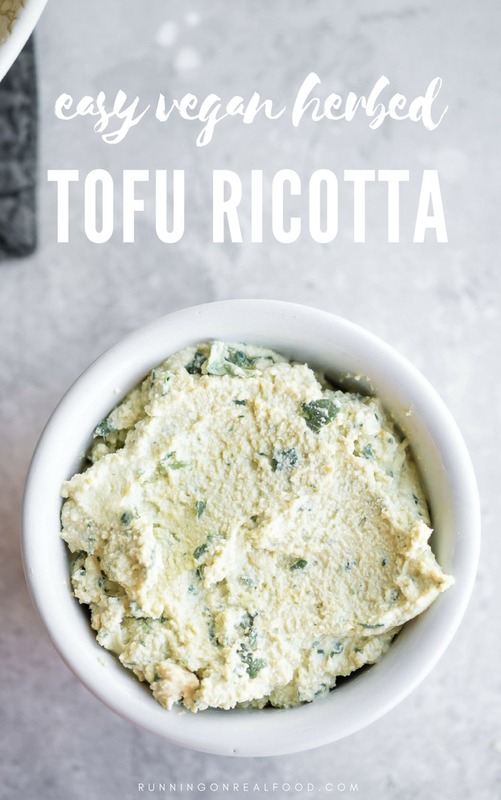 This simple vegan tofu ricotta takes just minutes to make and you only need some basic, everyday ingredients. Leave it plain or add fresh basil to make herbed ricotta. Serve this over a big bowl of zoodles or pasta, spread in sandwiches or as a dip for raw veggies. It gets nice and melty when mixed into warm pasta, which is one of my favourite ways to eat it. Blend all of the ingredients except for the basil until smooth, then add the basil and pulse a few times to combine. 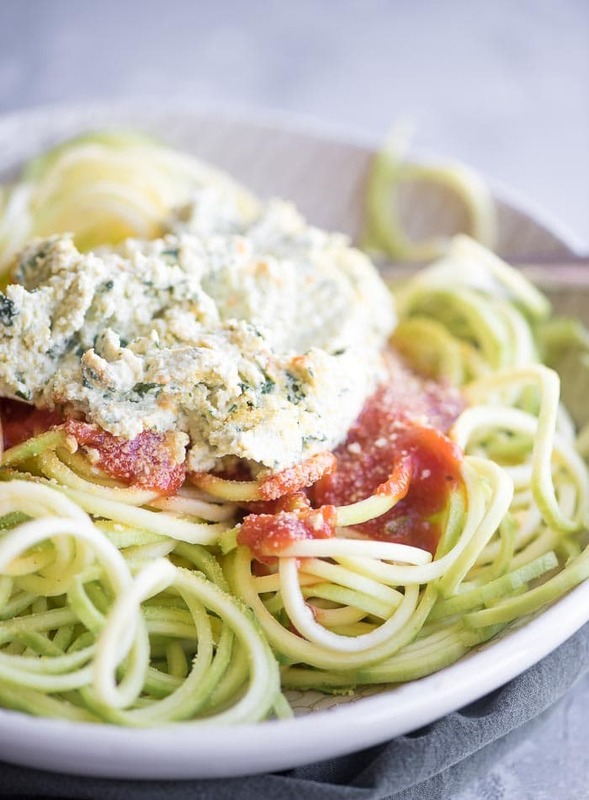 Serve over zucchini noodles, on crackers or a toasted bagel, vegan pizza, use for lasagna, as a dip for veggies, spread it in a wrap or sandwich or anywhere else you’d use ricotta. Store in the fridge up to one week.